So, we’re just over a week into 2014. How are you doing with your resolutions? As you might have read in my last post, I resolved not to make resolutions. My desire has been to follow the Spirit’s leading to make changes in my life and to not depend on a calendar to make the decision for me. Instead of resolutions, I’ve resorted to spending time in thought and prayer to see where the Lord might be leading me. Doing so has led to naming my years and working on His leadings whenever they occur. “Trust” has been repeating itself to me over the last many weeks. Pastoral messages, verses that stand out in my reading, blogs that seem to jump out at me, conversations with family members, even billboards (yes, really!) have all been communicating simple messages of trust to me. My quiet time and prayer time have confirmed to me the need to work on my walk with the Lord in this area, and I feel it is where He would desire my focus. In 2013’s Year of Hope, Jeremiah 29:11 became my key verse. There were aspects of 2012 (the Year of Obedience) which I needed to leave behind me and others on which I needed His help in building a future during 2013. The wonders of the Jeremiah verse made me smile with expectant hope every time I read the words, so it worked its way into my heart, my head, my memory and my hopes for 2013. After a lot of prayer, some reading, some translation reviews and quite a bit of study in the Greek text, I am feeling good about my key verse for 2014 to go along with the Year of Trust. It’s another verse which seems to be making me smile with expectant hopes. You see, it is the “God of hope” who offers us the ability to hope expectantly, because time and time again, He IS ALWAYS and HAS ALWAYS been shown to be true to His promises. He inspires hope within us, and He provides hope for us. The joy and peace which fill us come from knowing and understanding — but not always fully understanding — how He has worked together our past to bring about blessings in our present. Knowing His character and His promises brings about a deep joy and peace within the depths of our being, because we can TRUST in Him to continue to do the same for us in our future. 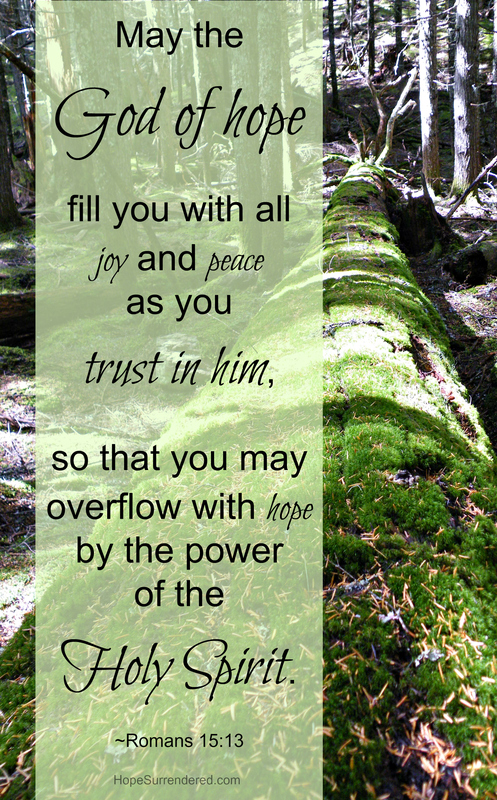 Do you overflow with hope? Yes and no to both! It is IN HIM which I desire to trust so greatly that it will be HIS joy, HIS peace, and HIS hope which overflow from me due to the work and the wondrous power of the Holy Spirit who resides in me. I feel as though 2013 was a year in which I felt a lot of this — and one in which I demonstrated some of this — but it is an unfinished work, because I still lack a level of trust in His promises. I will always be an unfinished work on this side of His Heavens, and so will you. He will never be finished with me, but I desire to do my part in seeking Him and in trusting Him by knowing Him even more. No matter what our circumstances may be, we live for, serve, love, are disciplined by, are blessed by, are shaped by, worship, praise and walk with a God who is so much bigger than any of it. I need to trust that. 2014 is the Year of Trust. Note: If you would like to use the image associated with this post to share with others or to offer encouragement, you are more than welcome to do so. You can copy it or forward it from this website, from my Hope Surrendered Facebook page, from my Google+ page or from my Twitter images. I only ask that you not alter the image in any way so that it continues to be referred back to Hope Surrendered. Thanks so much.